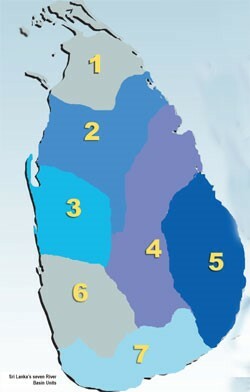 The only beneficiary of this Colebrooke formula, directly, was SJV Chelvanayagam, who used an artificial land boundary as the basis to locate a homeland in the Eastern Province, violating the universal truth that a homeland is a natural, organic and functional historic entity and not lines drawn on a paper. Thus, Tamil Nadu carved out of the Madras Province is the Tamil homeland. It is mind-boggling that not a single study was undertaken either before or after Chelvanayagam’s myth on the (un)suitability of this nine-province division in an island which has a physical geography of a complex central mountain mass and 103 rivers radiating from it. The two Monsoon seasons complicate the matter further. Yet, this formula was accepted like a God-given natural feature for the island just like the Pidurutalagala mountain range or the Mahaveli River. This is why president Sirisena’s public statement against the Colebrooke formula is of historical significance. Blind acceptance of Colebrooke boundary scheme as if it was a divine gift, meant that it acted as the underskirt of the country’s spatial skirt. All colonial and post-colonial processes that created spatial patterns on the land surface had underneath this provincial undergarment. Thus, new districts were carved out within it. An adjustment was made on its borders at Weli Oya, during security minister Lalith Athulathmudali’s tenure on strategic grounds, where three of the unit boundaries met. During the time of package deals, some adjustments were proposed to create a union of regions. The B-C and D-C agreements in 1957 and 1965 respectively, followed the lines of the underskirt. This underskirt became the skirt in 1987 with the 13th Amendment, especially with the merger of NP and EP, a synthetic marriage in which two artificial pieces were projected as a natural whole. Ever since, different minority groups are struggling to figure out how this underskirt could be converted to a nice and pretty looking ethnic/race skirt. Thus, President Sirisena’s statement is indeed a challenge, and if followed by action, a threat to these confused-exposed race-based political hands. The closest disagreement with the Colebrooke formula was the suggestion made by some Buddhist monks prior to 1948 to move the capital city from Colombo to Anuradhapura. Indeed, some think that SWRDB had actually entertained this idea when he was the longtime local government minister. Such suggestions are different from the mentality of some people to remove white governors’ names or statutes from roads and junctions. It is a collective awakening of the desire to remedy the accidents of the past, by forward-looking people on a new path of real independence (it is not clear if Anagarika Dharmapalama said something about the need for this spatial boundary adjustment). Brazil, Pakistan and Myanmar are three examples of countries moving their respective capital cities from a sea port to an inland location for economic, strategic and historical reasons. In this regard, Sri Lanka has a world record as the silliest capital city mover. Colombo region was a marshy area to begin with, and the capital city was moved 15 miles away to a marshy, already crowded flood-prone area based on petty political fancies creating environmental and social costs to people in both the new and old locations. Under the Colebrooke formula a province is divided into districts and districts to DRO units with each DRO in charge of grama seva niladharii units (GSN). During President Premadasa’s time the total number of GSN units was increased from 4,000 to 14,000. On what basis this decision was taken was not explained, other than may be the excuse to serve people more efficiently with better access, just like the original five provinces were gradually increased to nine to reduce the distance between the Kachcheri and the peasant. Was there a research study or was it an arbitrarily demarcated cheap job done as a partisan job of employment project? A massive spatial demarcation such as this could have been utilized as means to solve so many problems in the country including mismanagement, sustainable development and the international favorite called meaningful devolution. If one comprehends that the national-level as well as the grassroots -level spatial demarcations are arbitrary schemes which cannot meet the new needs and demands of the nation, the correct path to be taken is not an issue of antho-jata-bahi-jata. The best way to fathom the gravity of general mismanagement, erosion of ethical and moral values in the society and the total breakdown of discipline in the country is to look at the sixteen dreams prophesied in the Maha Supina Jathakaya. This is a much better index than the indices such a failed state, manufactured by the western global index industry, including those by some UN agencies. The global youth development index is the latest. For a person visiting his country of birth, the insecurity and the instability of the kind that the late Ven. Gangodawila Soma was explaining, is visible everywhere. Two mega reasons for this plight of the country are (1) the blind introduction of the free market liberal economy in 1978, and (2) the fear of death knowingly or unknowingly sunk deep into the hearts and minds of the people during the Tamil terrorist suicide bomb era. JVP terror in 1971 and in 1988/9, and the manner in which the state eliminated them was also a significant footnote in this saga. A survival of the fittest atmosphere had developed, and two generations have mental scars of the violence that took place. The state-sponsored private capitalism created a generation willing to sell even one’s mother or daughter for money. Recently, a new law was proposed to tackle the crisis of abandonment of elderly parents on roadside by their children. Unlike in some other countries there were no national policies or systematic, non-partisan national planning on national development, which even a country like India has with a stable public service sector. Thus, partisan politics destroyed the fabric of socio-economic development of people. This has happened while two other basic trends ruined the country since the 1960s. One was the gradual destruction of structural democracy in the country, such as erosion of the independence of the judiciary, rule of law, the concept of the separation powers, or abolition of the Senate. The other was the destruction of territorial democracy, the representative democracy after 1978 where voters lost the right to elect a representative of their choice, instead of a political party deciding it for them. Actually, the explosion of GSN units could also be considered as an extension of political party arm deep into the villagers’ daily life. So there is now a parliament that its speaker has compared to a toilet and a society without Hiri-Oththappa (fear and shame). Rich people import luxury cars using money remitted by poor women cleaning roads and toilets in Arab countries. Man is becoming the chief enemy of mankind in Sri Lanka. The decline in the country which is apparent but denied by politicians in power is a result of rapid politicalisation of all governmental entities by partisan politics. One could say that an evil trinity is ruling the country today, helping capitalist exploitation. The officer from top to the peon, the politician at all levels and the NGOs are in this triangle. Despite its class bias (the rich and the powerful always manipulated the system behind the scene for their benefit as succinctly described in the late S.L. Gunasekera’s biographical book, Lore of the law and other memories, 2011) the Soulbury constitution served the country reasonably well. But the 1972 constitution of Colvin and Felix Dias destroyed the public service by giving the Public Service Commission’s job to the cabinet. Ronnie de Mel once described the resulting direction of wind from his housewife’s perspective. When he was a CCS officer his wife prevented him joining politics as an MP’s had no powers. MPs had to obey the officer. But then in the late 1960s his wife (daughter of Sir Leo Fernando, one of the richest in Ceylon), gave him the green light to quit the CCS job and contest parliamentary elections. Politicians look at the next election and officers are forced to look at long-term effects of their decisions, which promote stability of the system of governance. A happy balance is required for the long-term well-being of the people. Unfortunately this did not take place. Instead, what the country got was a messy situation of good intentions gone wrong or bad intentions continuing. After nearly five centuries of colonial exploitation policies, by 1948 there were two countries in Ceylon: the rich, westernized, Euro-centric Colombo country and the poor Sinhala-Tamil speaking undeveloped rural Ceylon. Attempts made to reduce this gap did not work as witnessed from the 1971 JVP insurrection, and again in 1988/9. The diagnosis by the Youth Commission Report (March 1990) ended up as more words and no action or disorganized partisan political fuel such as the increase of GSN units from 4,000 to 14,000, just to give one example. There were other issues lying in backwaters such as the Kandyan Peasantry Commission Report of 1951. The threat of Marxism was a major concern (hence remove Indian Tamil votes) but under the cover of Section 29, reasonable redress of discrimination and loss of rights of the Sinhala Buddhists were shelved. In 1956 this did not happen in a reasonable fashion, because the government changed but the power of the ruling elites did not change. In 1962 they tried to capture power via a police-navy coup. High costs dry zone settlement schemes apart, partisan politics always had an agenda named concern for the villages. This was a lip service only with some marginal results as a side effect. A real and genuine concern for village welfare cannot happen by going to Anuradhapura for a celebration in the day time and returning to Colombo in the night. The civilizational trinity, village-tank-temple, has been a popular slogan, with fancy names given and changed from time to time: Jana Saviya, Gam Udava, Gama Naguma, Samurdhi, Divi Naguma and back to Samurdhi. What most people do not know is that there was an excellent village development program named Gami Diriya which operated free of politician meddling, and instead of supporting, it was sabotaged by a jealous minister. This reminds a similar village development and crime eradication program implemented in the 1940s by Ven. Kalukondayave Pragnasekara Mahanayaka Thero with the help of Justice Akbar and ASP Osmand de Silva. It had Sinhala, Tamil and Muslim participation with nationwide coverage, but the then governmental establishment sabotaged it. The 99 point program it implemented is still relevant to village problems today. Village as the center of development took a new turn during Eelam war and especially after the collapse of the Eelam project. The idea of Gram Rajjya was promoted by several organizations and by individuals. Sarvodaya was behind it for decades. The Tissa Vitharana APRC report as well as the LLRC report recommended it. The Abayawardena Report on local government Reforms (in 1999) strongly suggested going back to pre-1978 era of local government institutions. The concept of Jana Sabha was promoted after the war victory but then suddenly abandoned. Instead, a Divinaguma monster department was rushed into existence. Jana Sabhas must be non-political party based locally elected units with powers given by a constitutional amendment. Western democracies have vibrant city and county governmental units acting as buffers to soften undemocratic steps of a central government. Instead of promoting such local government units, western authors promote a new idea to control their former colonies in the guise of democratic human rights. With this strategy they help countries to break into pieces, aggravating rather than healing conflicts that they themselves had created in their former colonies. Sri Lanka’s Euro-centric (Europe is superior) new set of constitution-making masters are taking this path of creating unmajoritarian institutions” to control what they called the tyranny of majority.” They do not believe in the concept of discrimination with reason” which for example, has been used in India, USA and Malaysia to redress injustices done to the majority community under colonial rule. Promoted by white Eurocentric writers like the American professor Donald Horowitz, this method creates regional ethnic minority elites (for meaningful devolution such as under the 13th amendment) and slowly weakens the central governments in former colonies (it may take a decade or two or more), until a new Kosovo or South Sudan (or even a separate country of Scotland) is established splitting countries. Thus, the new policy of creating unmajoritarian institutions” is a sanitized” version of the old divide and rule policy, providing ladders to separatist monkeys to carve out separate countries, soon fighting as two states along the new border lines. Ethnic quota systems in employment, security forces etc., second chambers, panel or rotating systems of office bearers are methods which will create more friction than conciliation under this strategy. For Example, Tissa Vitharana’s APRC majority report proposed a Tamil policeman in each Sinhala village! Already, South Sudan started an internal war. American professor Joseph Nye also supports this Horowitz strategy, calling it the Soft Path to deal with the conflict-ridden former colonies. No need to send army (hard path) when the goal could be achieved using diplomacy, R2P or human rights of minorities. Real democracy of empowering people (not separatist party politicians) locally, is not in Horowitz-Nye project embraced by local Marxist and Christian constitution-making masters in Sri Lanka. Horowitz’s formula stops at regional ethnic politicians’ level, and it failed in Nigeria and Lebanon, two cases that Horowitz used to cite as success stories. It is also interesting to note that in his writings Horowitz did not mention even once the concept of Panchayathi Raj Institutes in India based on consensus politics (God speaks in five, if five people agree, god is with them). Horowitz was clueless about the Sri Lankan Gamsabhava. Sri Lankan villagers are today divided so hopelessly due to green, blue and red party politics. Fortunately, LLRC did not buy the Horowitz path” of devolution which would empower” Tamil separatist politicians. LLRC promoted meaningful empowerment of people at the village level to deal with social, economic and spatial inequities prevalent in the island, but it did not propose a mechanism. If majoritism is an adverse result of Bentham’s theory of greatest good for the greatest number, the solution comes from the consensus/community politics found among tribal governments in Africa and North America before the Columbus and Vasco da Gama visits. For example, in the 1750s Benjamin Franklin pleaded with the 13 American states to study and follow the consensus politics found among the native indigenous tribes. It is strange that the promoters of this strategy of non-majoritarian politics did not consider the Panchyath system in India or the Gam Sabha concept in Sri Lanka. Nye and Horowitz are totally silent about this path of consensus governing at local scale. Not only they ignore it, they are silent on the new western concept of the need to follow small scale, first advocated by Schumacher as Small Is Beautiful and Buddhist economics and advanced further by Kirkpatrick Sale (Human Scale, 1980). The Bio-regional vision is what Buddhists followed spiritually and practically including the right of birds to have a share of the paddy harvest. The falsity of two-party representative democracy was getting exposed both in Sri Lanka and in the USA for the past so many decades. In USA it has come to a climax now at the 2016 presidential election stage. In Sri Lanka it is a case of King Kosol’s Dreams come true. Perhaps, this was the reason why successive presidents of the country paid lip services to Buddhist ideals. President Sirisena said several times that he will govern the nation using Buddhist principles. These principles are nothing but acceptance of reasonableness in decisions affecting people differently due to spatial, social, political, economic and environmental (pollution, floods, landslides) inequalities that exist. These play on an ethnic map of Sri Lanka which is like a scrambled egg. A breakaway from the Colebrooke formula is the reasonable Buddhist path. It is also the path of science, geography and ecology in a world of global warming and global corporate invasion. Sustainable growth is possible only by thinking outside this box. The first step of this paradigm shift is the appointment of an expert panel to study how the lowest civil administration units (GSNs) could be re-demarcated as bio-regional, ecological (hydrological) units. In New Zealand this is the law. Local government units there must follow river basin boundaries. This is essentially what Sinhale society had for 2500 years known as the trinity of village-water tank-temple. With water-related criteria the actual number of GSN units could be around 4,000 and not 14,000. These could function as Jana Sabhas, similar to Panchayath Institutions in India with powers given by the constitution. Because these units are natural ecological units they form parts of larger river basins. They could be combined to form districts or provinces. The map below is an attempt by the retired geographer C. M. Maddumabandara to create seven large river basins for Sri Lanka, replacing Colebrooke’s division. All kinds of spatial units needed for administrative purposes could be formed combining these GSN units such as health, police, forest, education etc. People are not getting their daily basic needs fulfilled due to inefficient, unorganized, corrupt, bribe-taking government services which are highly politicalized. Empowering Jana Saba units with powers to take care of matters that can be locally handled, these public sector mismanagement defects could be solved. Samurdhi work can be done via local Jana Sabha, without partisan politics. Take this recent example (October 16, 2016) about the new National Marga Sathi-Gami Pubuduva (Road week village awakening) of minister of highways and higher education. In Nuvara Eliya district, Valapane divison at Nildandahinna, he organized one week program to undertake: (1) road improvement (2) awareness of digital technology (3) solid waste management (4) coconut cultivation (5) licenses for land owners (6) cement distribution (7) awareness of communicable and non-communicable diseases (8) home gardening and fertilizer use (9) distribution of agricultural equipment, and (10) occupational guidance for GCE-AL students. Are these not matters that can be better handled by a Jana Sabha on a continuing basis without politicians? Acceptance of ecology-based GSN units and making them Jana Sabha units with local ten member team elected on non-political party basis to handle locally, matters such as health, environment, primary education, dispute settlement etc. is also the answer to global Tamil fight for a Tamil country located in this Island. The current project to implement non-majoritarian instruments in Sri Lanka is clearly the path of Eelam, and border wars thereafter, which must be avoided at any cost. When Tamils and Muslims have thousands of Jana Sabhas their community aspirations (group rights) can be achieved without being a threat to the majority Sinhala society. No Sri Lankan president can stop the world Tamil movement for a separate Tamil country, but he or she can prevent that there is no real estate in this island to plant it. Meaningful devolution must be effective empowerment of village people and not what Tamil politicians dreamt since the early 1920s. How this new paradigm could be implemented was presented to the LLRC. This plan was discussed with former president Rajapaksa at least three times and he entrusted his secretary to work on this plan. Presidents are ruined by those who pretend to be their loyal servants. Under the American Fulbright scholarship program, the first person selected was not a researcher or an academic but a young CCS cadet. This person became secretary to six PMs and two presidents. The American embassy thus had its Fulbright ears at the cabinet meetings. This is how the real world operates. This entry was posted on Thursday, November 3rd, 2016. You can follow any responses to this entry through the RSS 2.0 feed. You can skip to the end and leave a response.